Tardigrades are well known to many microscopists, but few people are aware of their fascinating biology. 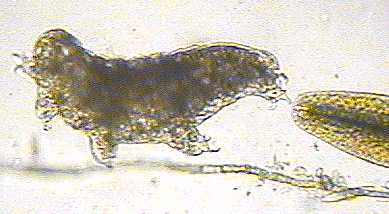 Characterised by their short bodies (typically 0.5 mm long) with eight legs terminating in claws, they were for many years classified with the spiders and mites, before it was recognised that their unique biology merited their own phylum, Tardigrada. They are widely distributed from the tropics to the polar regions, and occur in a wide variety of habitats including mosses, lichen, soils, sands, leaf litter, marine sediments and for some marine species, in association with marine molluscs. Many of the terrestrial species are able to withstand long periods of desiccation by a process known as anhydrobiosis (life without water). The tardigrade forms a dried, resistant state called a tun, and can survive for many years without water. When rain arrives, the tun rehydrates and the tardigrade is active again within a few hours. It has been known for tardigrades to survive for over 100 years in this dehydrated form. In addition to resistance to drying, the tun state can also be frozen in the laboratory to −270°C without killing the animal. This ability is of great survival importance to the tardigrade in times of drought, and for some species regular cycles of drying and wetting may help prevent fungal infection of the tardigrade. In many ways, tardigrades are an ideal subject for the amateur microscopist to study; they are very widespread and can be collected from the nearest garden, roof or gutter, only simple equipment is needed to extract them from their habitat, and mounts can be made easily. There are probably fewer than 50 people world-wide working on tardigrades, so there is good scope for the amateur to make a real contribution to our knowledge of these creatures. In order to start looking at tardigrades, simply collect some moss from a pavement or roof (the flat Bryum or Ceratodon species are ideal), soak it in tap water for several hours, and then squeeze the water out into a transparent dish. Tardigrades can be found at low magnification (a stereo microscope magnifying ×20 is ideal) and can be recognised by their slug-like appearance and active legs. It is from their characteristic bear-like gait that they are given their common name, water bears. Examine specimens in a drop of water under a coverslip at ×100 to ×400, or make permanent mounts for future identification using a water-based mountant such as NBS Aqueous Mountant. For further information on tardigrades, refer to The Biology of Tardigrades by Ian Kinchin (1994, Portland Press). A copy is available for loan to members in the Quekett Lending Library. The Club’s Journal also has several papers published on tardigrades. Editor’s note: Phil Greaves, who specialises in these interesting creatures, has kindly contributed this article. As Phil comments, a common name for them is “water bears” and when I come across these from time to time, their resemblance to bears, in both appearance and behaviour, is quite striking!